Quoted by Georges Peillex in the text for the supplement of the exhibition catalog entitled Louis Valtat; Retrospective Centenaire (1869-1968), Genève: Petit Palais, 1969. 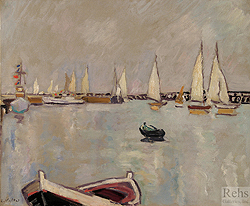 Louis Valtat was born in Dieppe, in the Normandy region of France on August 8, 1869 into a wealthy family of ship owners. He spent much of his childhood in Versailles, a suburb of Paris, where he attended secondary school at the Lycée Hoche. 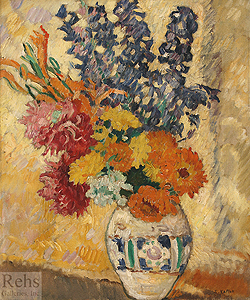 Encouraged by his father, an amateur landscape painter himself, Valtat became interested in art, and at the age of seventeen decided to pursue an artistic career. In 1887, he moved to Paris, where he enrolled at the École des Beaux-Arts (School of Fine Arts), and studied with the well known academic artists Gustave Boulanger (1824-1888), Jules Lefebvre (1836-1911), and later with Benjamin Constant (1845-1902). Afterward, Valtat studied at the Académie Julian (Julian Academy) under Jules Dupré (1811-1889), a landscape painter of the Barbizon school. His fellow students included Albert André (1869-1954), who became a close friend, as well as Maurice Denis (1870-1943), Pierre Bonnard (1867-1947), and Edouard Vuillard (1868-1940), who, at that time, were members of the Nabis movement. Calling themselves “Nabis” after the Hebrew word meaning prophets, they were influenced by Paul Gauguin’s (1848-1903) innovative Synthetist method of painting based on the use of simple forms, lines, pure colors, and large patterns. 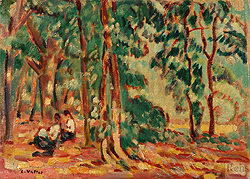 While Valtat remained detached form this movement, he learned through them the Gauguin method of painting, a method that would influence his works at a later stage. At the end of 1894, Valtat collaborated with Henri Toulouse Lautrec (1864-1911) and his friend André on the set of Aurélien-François Lugné-Poë’s play Chariot de terre cuite (The Terracotta Chariot), performed at the Théâtre de l’Oeuvre (Oeuvre Theatre) in Paris. At that time, Valtat began to suffer from tuberculosis and traveled to Banylus in the South of France to recuperate. There he met a number of artists including Georges-Daniel de Monfried (1856-1929), a friend of Gaugin, and Aristide Maillol (1861-1944), who was just turning his attention to sculpture. In 1895, he visited Spain, and then returned to continue his convalescence in the South of France in Arcachon. From 1898 until 1914, Valtat began to spend more time in the South of France. He traveled with his girlfriend, Suzanne whom he married in 1900. At first, they went to Agay, a small fishing village, and then to Anthéor, on the coast between St. Raphael and Cannes, where he built a house. 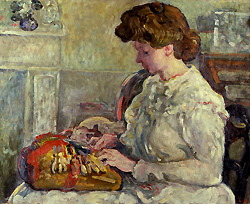 While in the South of France, he continued to broaden his contacts with other artists in the area, such as Auguste Renoir (1841-1919) and Paul Signac (1863-1935). Between 1900 and 1905, Valtat visited Renoir in his house in Cagnes, and together they collaborated on several works, most importantly a bust of Cézannes in bronze (1905). During this time, Valtat traveled in France and abroad. In the spring and summer time, he used to go to Port-En-Bessin in Arromanches, and Ouistreham in the Normandy region. Valtat also visited Italy in 1902 and Algeria in 1903. 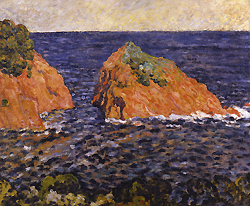 These trips, and in particular, his stay at Anthéor with its rocks, sky and Mediterranean sea inspired Valtat to use the intense red and blue colors, which became part of his palette. In 1927, Valtat was awarded the Chevalier de la Légion d’Honneur (Knight of the Legion of Honor), which was considered the premier order of France. He continued to paint, and “right up to his last years, Valtat respected this fidelity to his inner self and became practised in resisting the numerous temptations of the period. He was deterred neither by the success of other artists, nor by his own rather tardy ascent. ” (Cogniat, pg, 29) On the contrary, he was always devoted to his work and “From the beginning to the end of his career, he was simply, both knowingly and scrupulously, a painter of great integrity whose love of life and nature were embodied in his landscapes, his flower-pieces and interiors.” (Cogniat, pg. 24) After the exodus of 1940 and the occupation of France by the Germans, Valtat hardly left his studio at l’avenue Wagram. He began to suffer from glaucoma that made him blind in 1948, and after becoming ill, Valtat died on January 2, 1952 in a clinic in Paris.